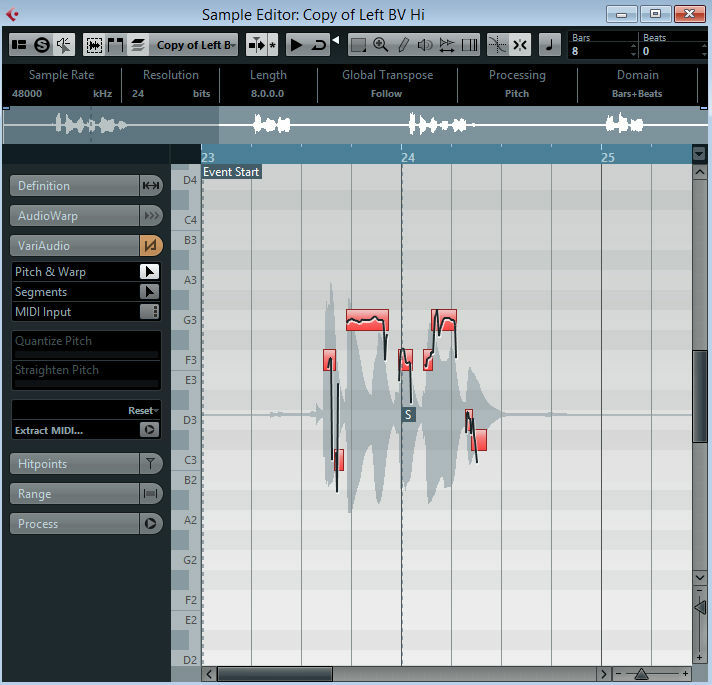 December 5th 2012 sees the release of Steinberg’s new flagship DAW application Cubase 7. It’s a major update. Lots of new design and work-flow features but some of them are hidden away and if you don’t read the manual carefully you may miss them. This is not a review of Cubase 7, it is a compilation of some useful things I have come across that were not that obvious at first. Some may already exist as part of earlier versions. Long clicks are a new addition to the mouse arsenal. A long click is basically a single left click but the button is held down for longer than normal. 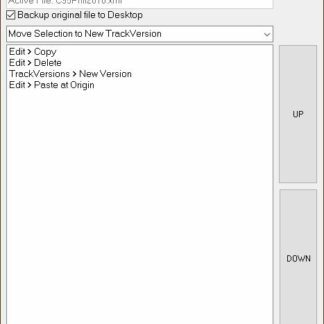 A very useful and often missed feature that enables us to put a track constantly into Solo Mode so it will not be muted when other tracks are in solo. 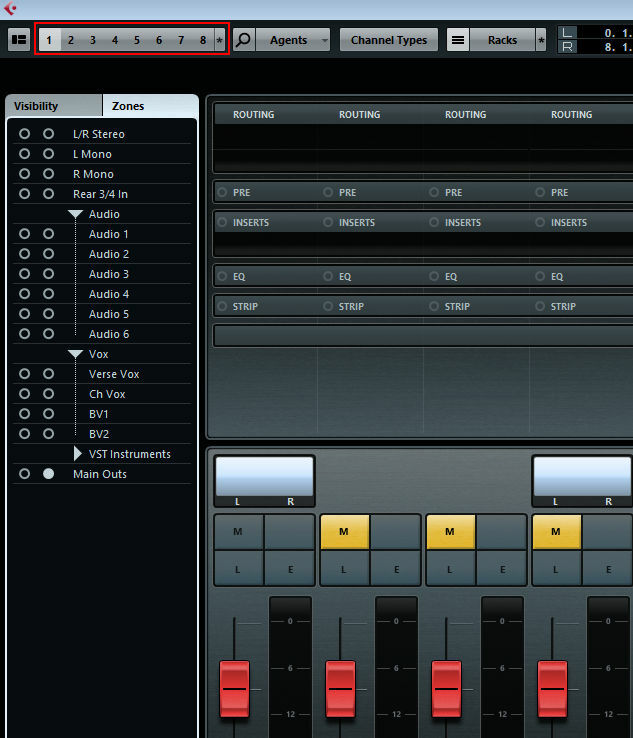 A single left click on the mixer Solo Button puts the channel into Solo Mode. 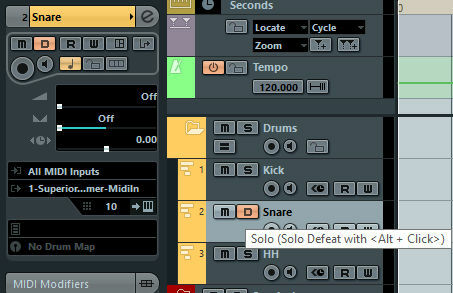 A Long Click on the mixer Solo Button puts the channel into Solo Defeat Mode. Watch out for the confusing hint on the project page track list though. The long click doesn’t work there yet (apart from on the fader strip). Instead you must Ctrl+Alt+Click to toggle Solo Defeat. Ignore the hint text, it is incorrect at this time but presumably will be fixed in an update. 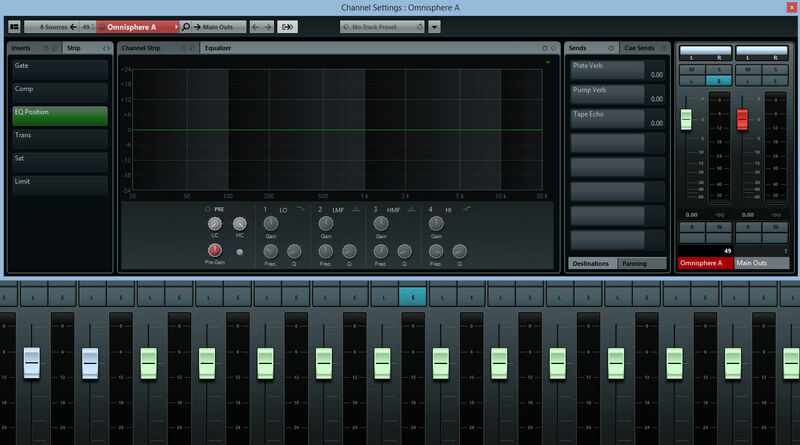 A single left click on the E (Edit) button in the mixer will bring up that mixer channel’s “Channel Settings” area. If this is a VST Instrument Channel a Long Click will bring up the actual VSTi that is feeding that channel – Very neat. The edit button now shows a “K”. 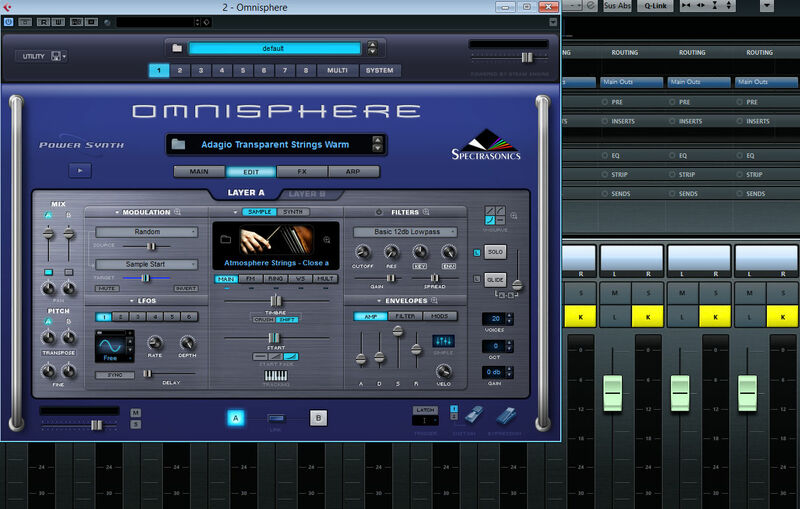 If you are viewing a MIDI Track that is connected to a VST Instrument, the VSTi channel is fully integrated into the Inspector view. So you can easily open up the actual VSTi Channel Settings rather than the (underused) MIDI channel settings. Also the full audio fader and inserts etc. are available right there in the inspector too. 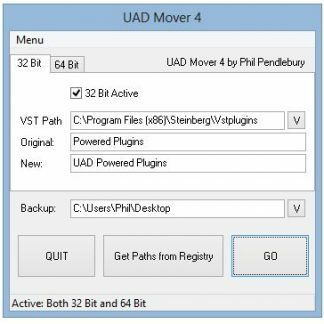 This is not new to Cubase 7 but is an often missed feature. 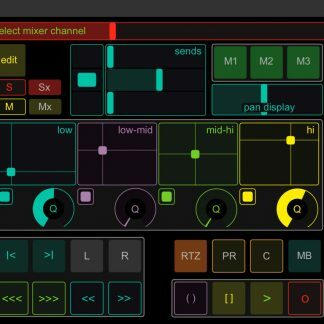 Mixer Rack – Exclusive Mode? This is an almost hidden feature. If you click the little * next to the Racks Button, you can turn Exclusive mode off. When Exclusive Mode is ON the rack will hide a section every time you open a new section. When Exclusive mode is OFF (my preference), it is now possible to show any number of rack sections at the same time. (Animated GIF). While we are in the Rack area. It is very handy to set up Key Commands to enable a quick toggle of the rack sections. 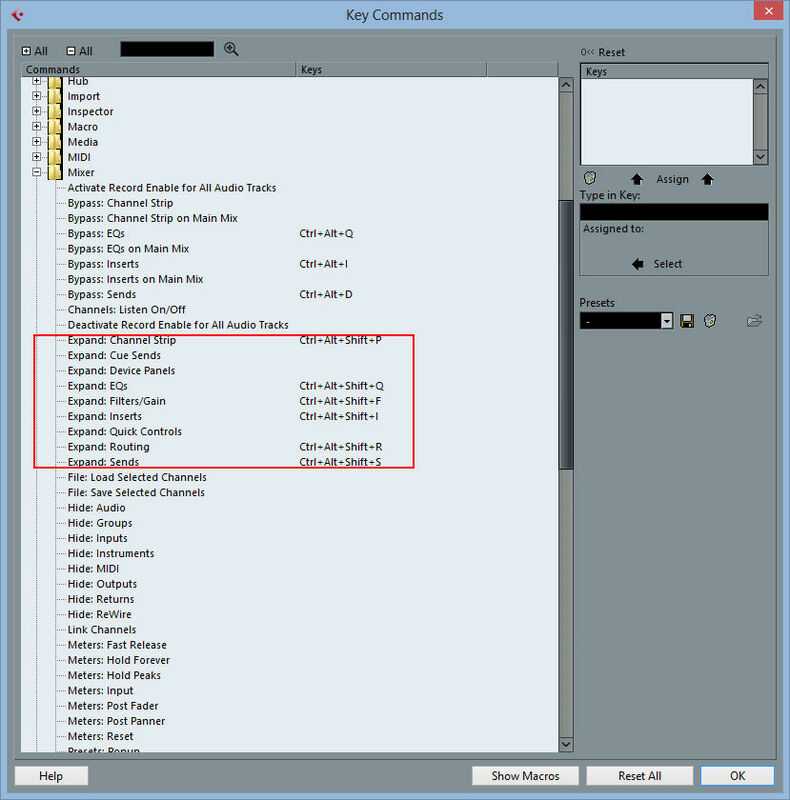 Go to Key Commands and look for Mixer – Expand. My Keys may look a little ungainly but I have them all assigned to single keys on a Logitech G510. You’ll originally only see 4 choices but once you use 4 you will get extra, until the total reaches 8. You may have noticed that all the controls in the new Strip are after the Inserts. This can be easily changed in the Channel Settings area. As can the position of the EQ. (Animated GIF). Also in Channel Settings is the rather small but significant EQ Display Type button. (Animated GIF). Did you notice some extra things on my mixer display compared to yours? They are all accessed by a Right Click in the Bar at the top of the mixer. The same can also be done in the Channel Settings window to show more optional controls. You can step through (fwd / rev) each note segment using LEFT / RIGHT ARROW keys. But you can also make the pitch lower or higher using UP / DOWN ARROW keys. This means a whole vocal can be sorted without having to leave the keyboard – (Apart from obviously reading mistakes and other subtle things) – inevitably you will have to go back through it and look at fine detail but this helps a lot, especially with a vocal that is fundamentally perfect to begin with. 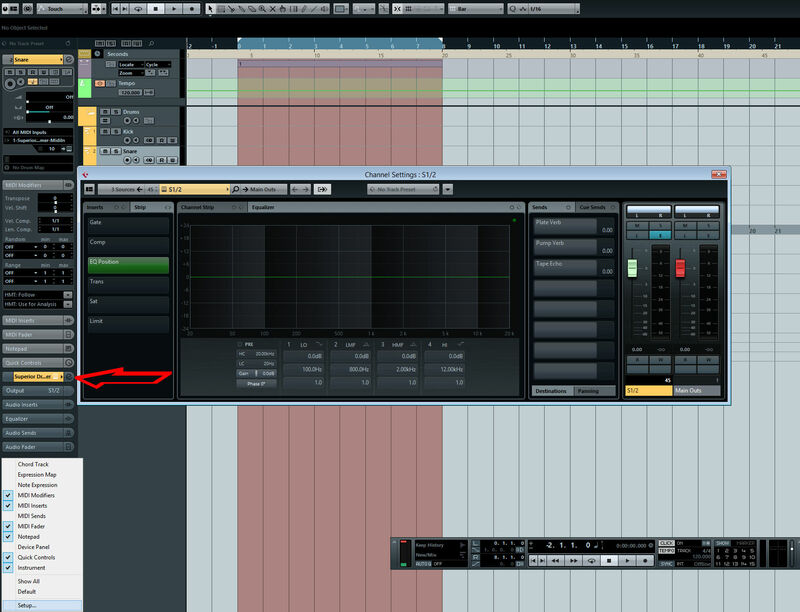 Note this is possible in other versions of Cubase too. Have you found yourself saying “How do I adjust the levels of the click, Listen Levels, Dim?” and so on. All that is neatly hidden in the Control Room Panel. There really isn’t much of clue how to reach this – So here it is. (Animated GIF). So you want to adjust your colour preferences in a bit more detail and make them match a bit better? There is another hidden control. Right Click on a colour in the Colour Selector. You will now see options to Copy / Paste and a neat RGB Pallete. The Key to making Black Notes Black. Talking of colours; There is an issue in the Key Editor where the default colour for black notes on the piano roll is white. Believe it or not, some folks prefer it this way. 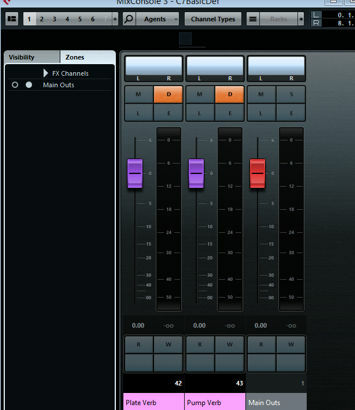 But if you don’t – Update to Cubase 7.01 – Adjust colours as you desire. Mem Zap – What is it? The much talked about but not found feature Mem Zap is basically a zoom memory function. Then Hit Mem to memorise your current state before you move somewhere else. Then Hit Zap to go back. Subsequent hits of Zap will alternate between them etc. I hope you find some of these useful. I will add more as I find them. If you are a new Cubase 7 user, you may want to have a look at my tutorial on basic use of the free Curve EQ: Using Voxengo Curve EQ to Clone EQ Settings.